An ultra lightweight aluminium transit wheelchair with attendant brakes, this Escape Lite model is equally at home indoors or out. The brakes have two settings, one for stopping and the other for gentler braking when heading downhill outside. 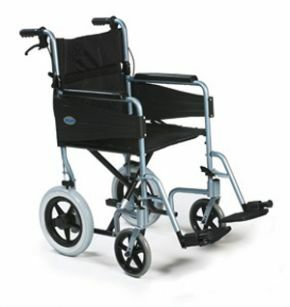 The tyres and front castors are puncture-proof and sturdy enough for outdoor use. The design is compact and available in two seat widths- the 16" choice is especially good for smaller users who would benefit from the convenience and manoeuvrability of a less bulky chair. Both options fold up for easy transport or storage. Contacted A.M.C. by phone. Staff were very helpful and arranged delivery on a day to suit me. The wheelchair arrived on the day as arranged . The description on the internet site was exactly correct. The wheelchair is the Escape Lite model. Thanks again to the staff [ Tracy} for the help given.